"I have always felt that the human figure is the most perfect vehicle for expression." Gloria Ortiz-Hernandez assembles two separate components in the creation of each piece: a wooden, hand-carved, three-dimensional figure set in a centered, recessed space, and a painting, always square and small in size. 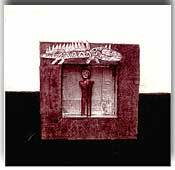 She uses a variety of media in her carvings  gold and silver leaf, lead, wood, paper, wire. Her paintings are also done in a mix of media  acrylic paint, pastel, colored pencils, charcoal. In her work, Ortiz-Hernandez doesn't want to be specifically associated with any ethnic group or geographical location. By distancing herself from the limitations of person and place, Ortiz-Hernandez is able to create artistic figures that become universal  every man, every woman.